L'As des Neiges is the newest restaurant on the ever-evolving restaurant scene in Les Gets. They opened during October 2017 and as our local coiffure had told us the chef was Paul Bocuse trained I was keen to get in there and try it! The restaurant is located in town on the Rue du Centre on the corner where the Bel Alps Hotel used to be. They have 2 restaurants - L'As des Neiges is the restaurant Gourmand, next door and linked is Le Comptoir a more casual dining and takeaway restaurant with a bar serving artisan bieres. 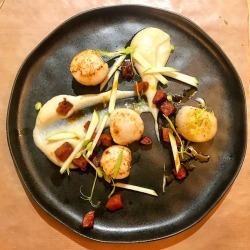 Le Comptoir serves a menu travail of 3 courses for €14:50. So these 2 restaurants have something to suit all palates. The owners Alexandre and Sandra Balagna are both trained chefs. Sandra is the patisserie chef and was front of house when we went for lunch and Alexandre the chef de cuisine. Alexandre is a Bachelor from the Institute Paul Bocuse in Lyon. He has worked in several Michelin Starred restaurants including the 2 star Le Palace K2 in Courchevel, Bulgari Hotel in London and the Michelin 3 star La Côte St. Jacques in Joigny. So for lunch on Saturday we tried L'As des Neiges which translated literally means Ace of the Snow! I'd say we drew the Ace! We were greeted by friendly staff and this continued throughout our lunch. The decor is really great, funky artwork and a modern Savoyard feel with stone and wood and flashes of orange! anyone who knows me knows that a flash of orange always pleases me! Our waiter was sporting an orange bow tie! The waiting staff were very good and knowledgeable about the food they served and wines suggested. There were several options to choose from. The menu Poudreuse a 3-course set menu at €32:00 or a choice of 2 courses priced at €26 and €28. The Avalanche menu which is what I'd like to go for next time - you let the chef guide and put together an individual menu just for you - 3 courses - €38 and 4 courses - €44. 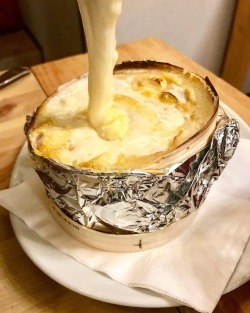 There is an a la carte menu offering 3 delicious sounding choices and of course the Savoyarde Specialities including Fondue and Tartiflette that we all love in the winter featuring the local cheeses! It's great to have another gastronomic restaurant in Les Gets, we are spoilt for choice! Based in the centre of the village only a few minutes walk from the slopes, I'm sure it will be a popular choice with locals and holiday makers! I can't wait to go back. I enjoyed lunch at my own expense and this is my opinion of my personal experience at L'As des Neiges. To book a table call 04 50 80 62 53. That place looks like a really good update of traditional Savoie cuisine. I like the ski styled decor too! I love the sound of the mushroom veloute and the beef and pork dishes sound like proper winter warmers! What a wonderful meal! 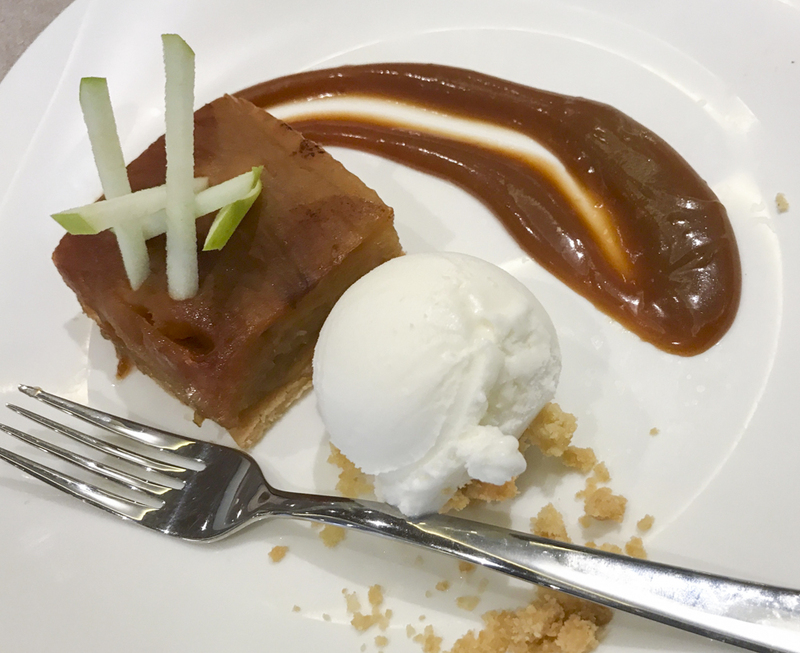 From the dainty amuse bouche offerings through to the more robust tagliata of beef and the delicious aplpe caramel dessert, everything looks so good. I can see why you enjoyed it so much!